And so a new challenge beings. Barry and I committed to the Palm Beach to Manly swim last week. We have a boat and driver booked for Sunday December 6 this year, weather permitting. I’ve laid out the preliminary course (see below). This will need some work as it takes us a long way offshore. Starting to feel pretty good and beginning to push for the first time since I hurt myself. In a strange reversal of fortune, Barry has had a bad virus, hasn’t swum at all in the last week and won’t be swimming this week. I’ve jumped out ahead of him but no doubt he’ll catch me quickly. I’ve signed up for squad training at Manly pool and hope to get underway this week although I have to go into hospital for the gut procedure mid week so that may be a bit optimistic. I think I’ll get pretty tired before this is over. I slept for 2 hours after I arrived home from the club on Sunday morning. Right knee still pretty sore although it comes and goes. Start gym again this week with a double session on Wednesday. And so six months has gone by since I went under the knife. In a planned 18 month rehab program, I’m 1/3 of the way through. 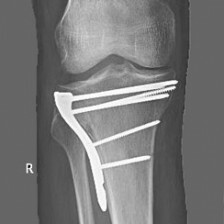 I don’t know why six months is significant but it’s certainly beyond the initial stages of pain management and learning to walk again but not quite to complete recovery. For those interested in milestones or how you should be going at this stage I thought i’d record some observations. What do you think of the photograph above? Isn’t it great. 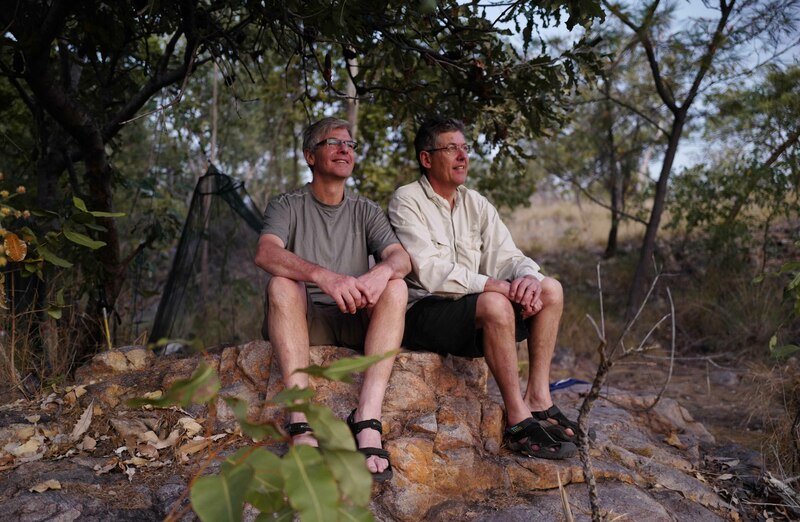 This was taken yesterday, on my first Wednesday after arriving back from the Jatbula track. I’d had a couple of days off and decided to join the Balmoral Beach Club gang and the Bold & Beautiful gang for the 6:30 AM swim at Manly. 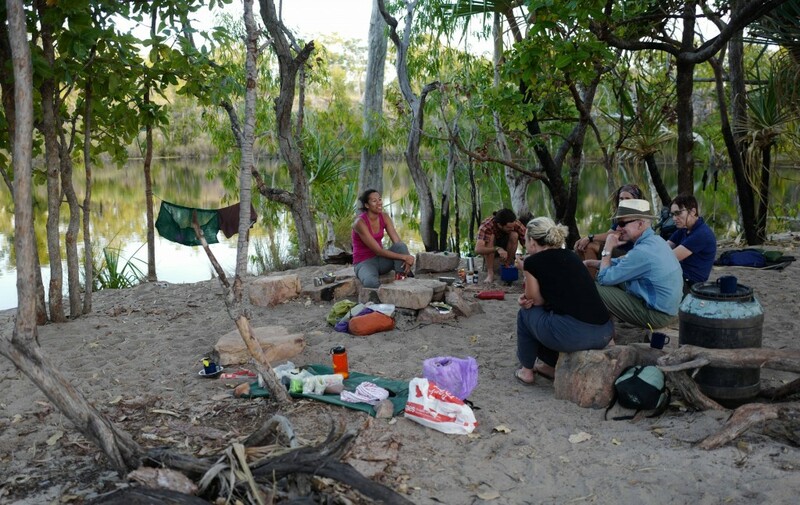 The moon that had hung lamp-like over my campsite, lighting the pandanus and casting a silvery glow over the waterholes, was now but a faint sliver. 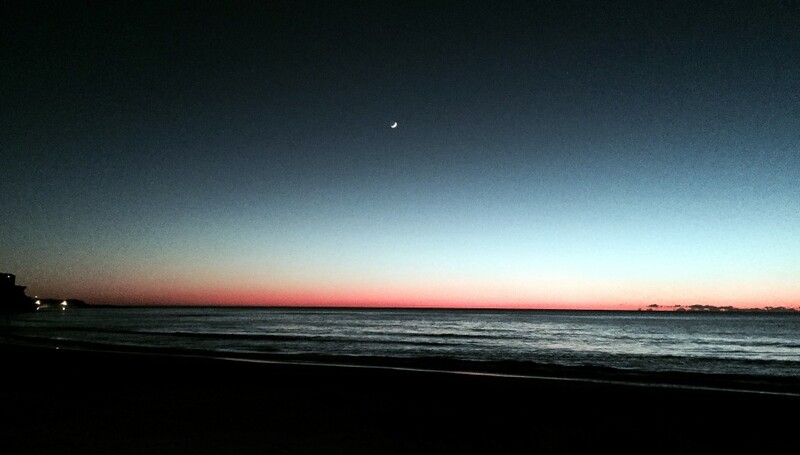 As I always do when I walk out in the morning, I stopped and stared at a pristine dawn. Not pristine like the Australian outback with all its silence and stillness and its ancient loneliness, but pristine nevertheless. On the fringe of a major international city that is remarkable. Today on the long Thursday swim at Balmoral the showers were broken and it was below 14°c. I couldn’t adjust to the cold during the swim and was shivering so much back in the clubhouse I couldn’t put my shirt on. I ended up wrapped in a space blanket. Welcome back to winter in Sydney. On May 15, this year, I published, on this blog, a 3 month milestone table. It’s interesting to go back and have a look. At six months quite a bit has changed. Some things are still the same. 1) Walk with a natural gait without limping. 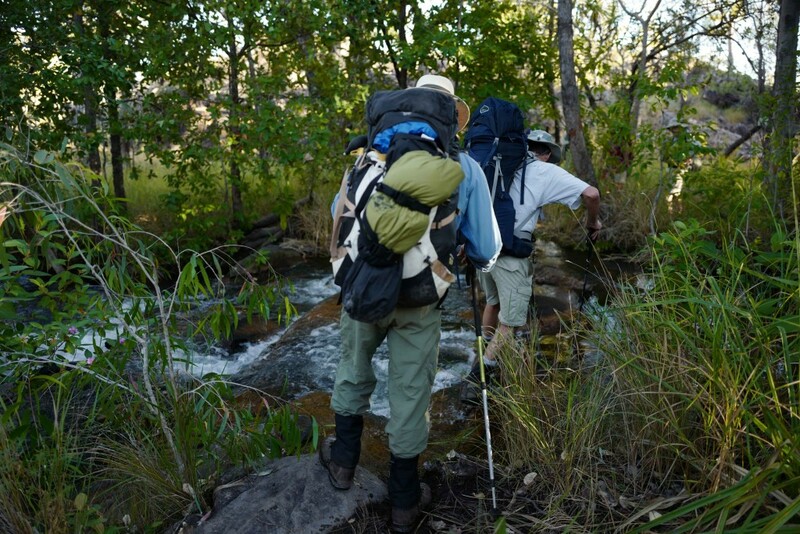 3) Carry a light backpack – no more than 20kgs – for medium distances – say 17 kms over fairly flat ground – without pain, discomfit or exhaustion and using both legs evenly for stepping up and down. 5) Lying on your back you should be able to draw the heel of your injured leg towards your buttocks with the flexion through the knee joint virtually identical to that in your good leg. 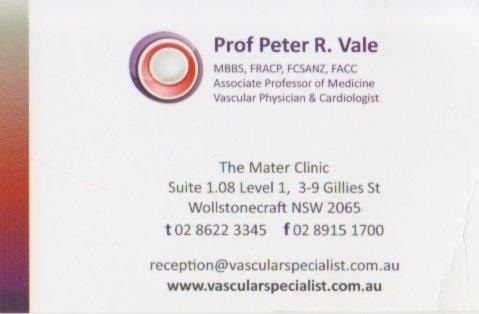 Off to see Prof Peter Vale, my vein guy, this morning. This was my second visit to him to see if, following the long treatment on Xarelto (Rivaroxaban), I was now clear of clots and could stop taking the anti-coagulant. I hadn’t seen him since my previous visit on 18th May. Gee the time goes by – that’s nearly three months ago. I felt a bit guilty admitting I’d already taken myself off the Xarelto a couple of weeks ago after a bit of self diagnosis on my CT scans. I don’t think he was too happy about that, or that I hadn’t followed up on his advice to have a chest X ray for any embolisms that might have travelled. It’s hard to explain that you can only cope with so many rounds of drugs and scans and x rays before something inside you says, “No, this has to stop. I can’t do this anymore.” Anyway the good news is the clots have all gone, the swelling in my leg has gone down remarkably but I’ll have to take anti-coagulants on long plane flights for the rest of my life. Anyway that’s out of the way and I can now concentrate on the muscular rehabilitation. My vein guy. 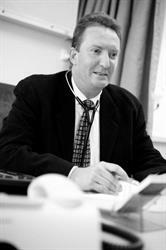 A good bloke and a good doctor too. Peter Vale is a good guy. Pretty practical and he doesn’t mind explaining things to the patient. Gee I’ve supported half the private schools on the North Shore this year with all the money I’ve spent on doctors. One of those schools should name a library after me. Back safely in Darwin. Hot shower and a steak at the Cav. I don’t need these trappings. A swim in the afternoon and talk round a campfire is an experience that cant be repeated in town. Cut Magic Dave’s strapping off my left foot. It’s fine. All healed now. Survived the trip well. Right leg isn’t sore either, so I seemed to get away with it ok. An easy walk. Flat and good under foot. Not as rough as the Larapinta Track, not as hot, wet or historic as Kokoda but one of the best things I’ve done in Australia. You do it for the fun and the waterholes and what other reasons do you need. Back to winter and cold water in Sydney. Day 5. Woke up at regulation time of 5.30am. Felt pretty good. Nothing hurt after yesterday’s long march. Another easy tab coming up today – about 15km. Got going at 7.20am, heading south west, following downstream course of the Edith River which was to our left. As always happens on these expeditions, everyone gets more efficient, packs quicker as the days roll on. Easy walking brought us to Edith River South at 9.10am. This marked the 52.2km point n the journey showing just how easy a time we have been having. We would have covered 60km in two days in the Tanami. I’m puzzled how I ever did that – day after day, for 6 weeks with no rest days and 1.5 tonnes of gear to get off the camels every morning and night. 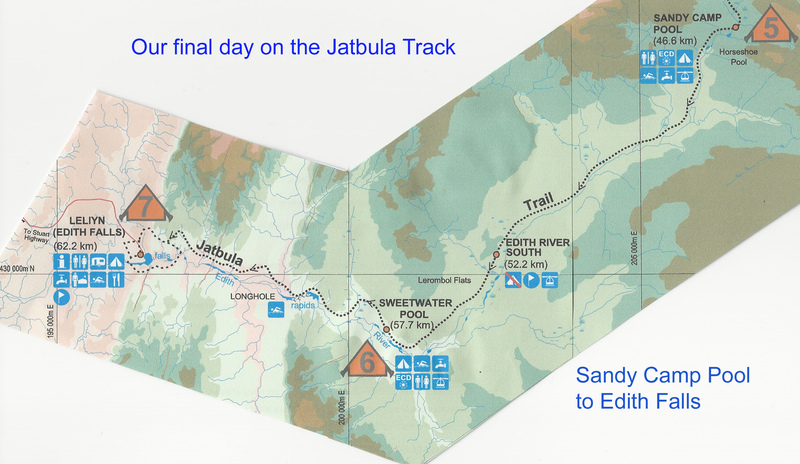 At 11am reached Sweetwater Pool, encountering for the first time, trekkers and day-walkers coming in from the western end of the track – the Edith Falls end – to see this spot. It’s justifiably a significant landmark on the Jatbula. It’s a huge, rectangular rock hole about 100 m long. This was a luncheon spot. The rock hole looked purpose built for swimming races. So that’s what we did. I challenged Barry to a decider – best of three after the previous two contests. There was great debate about the appropriate handicap and Tony Smuts, Balmoral Beach Club esteemed handicapper treated it with disdain and refused to get involved. That was probably wise. Anyway I got a 17 second start from Barry for two laps – up and back – in the waterhole. It was magically clear fresh water. I beat Barry by a body length but I think me let me win just so I would feel good. Anyway that’s two wins and one draw so far. There were suggestions that I had jumped the gun and gone early. There was some controversy and discussion about this from observers on the bank. 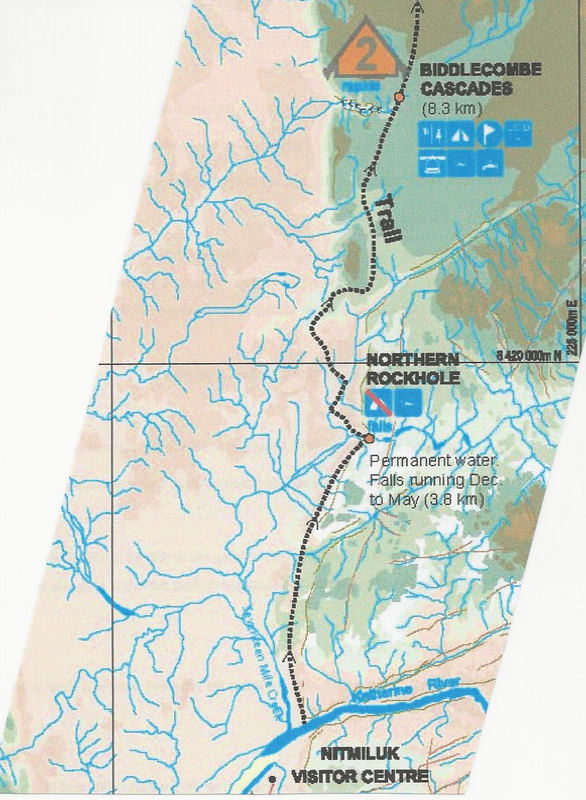 At noon set off heading west along the northern bank of the Edith River on the last leg of the journey. I really dawdled as I didn’t want it to end. At 12.25pm reached a place called Long Hole pool, really spectacular and I was a bit nonplussed to find we hadn’t even found the big rockholes. At 13.20 we arrived, regretfully, at Edith Falls carpark where the bus was waiting to take us to Darwin. A journey of 62.2km on my broken leg was complete. I congratulated and thanked Barry for allowing me to come along. 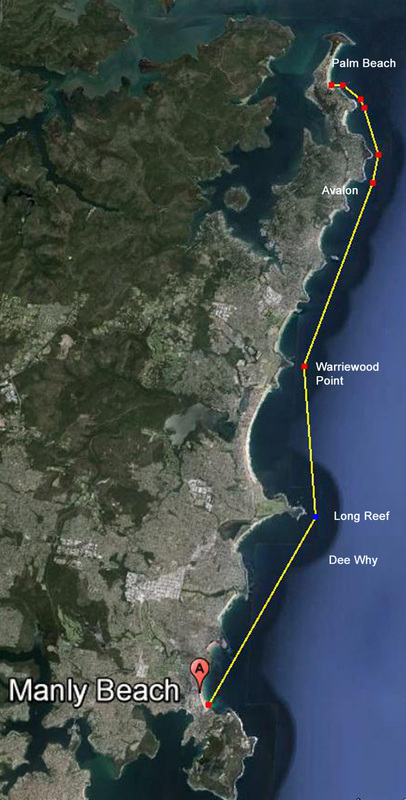 We now turn our attention to goal no 3 – the Palm Beach to Manly swim. 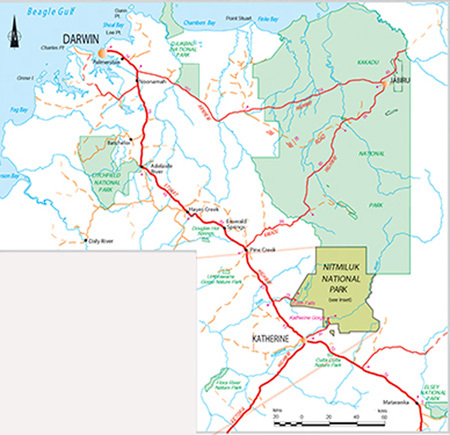 Only 31km half the distance of the Jatbula and it should be less sweaty. Up at 530 as they wanted to clear camp early. We had a long day ahead of us and they didn’t want to be marching in the heat of the afternoon. Quick breakfast and away at 7:20 AM heading due north. Scenery much the same as the other days. At 1050 crossed the Edith River at a shallow bar and sat on a rock ledge under a beautiful big shady tree. I had no aches or pains and had been walking steadily but slowly all morning. Feeling pretty good. I’m always at the back now. Kelvin up the front. He is a very strong walker. Sometimes Barry or Robbie drop back and keep me company which is good but I’m also happy to just walk along my own. I’m still averaging about 3 km an hour. At 11.15 headed out again and 15 minutes later reached a mellow spot called Channels Waterhole. Not much shade but a nice rock ledge next to the water. Some of them had a swim but I decided I’d just take it easy and sit for a while. We watched tadpoles skimming along the shallow waters at the edge of the waterhole and hoped they weren’t Cane Toads. There hasn’t been any sighting of cane toads since the first night which is welcome. At 1245 we set off into the heat of the afternoon, but by 1400 had reached our destination for the evening which was Sandy camp. This was yet another amazing waterhole but this time it actually had a sandy beach. I’ve never seen anything like the waterhole’s along the Jatbula track. The campsite I chose, under a canopy of Pandanus palms was sandy and so comfortable as to be almost unbelievable. I doubt if I have had a more comfortable campsite in the Australian outback. Second round of the Jatbula Cup swimming trophy went well. Two laps of the waterhole and I just edged out Barry . I think the freshwater must be troubling him because he would normally slaughter me. Again controversy over the handicaps.The day was only marred by the fact that the guides announced that we would be having dahl for dinner. I haven’t had dahl since 1977 in India and Nepal where I was forced to eat it every day. It was really crook then and it was really crook now and I let everybody know that toast is far superior. Not many agreed.There are quite a few health food aficionados on this trip. Amanda is a vegetarian. I was pretty tired after a long day’s march but my leg stood up to it very well. Dave the Wizard’s Magic Tape is hanging in there but there’s not much left. Nevermind, I’m not going to have trouble with my left foot now that the long day is behind us. It’s only 15 km tomorrow and we will be finished.We have now done 46.6 km in four days. 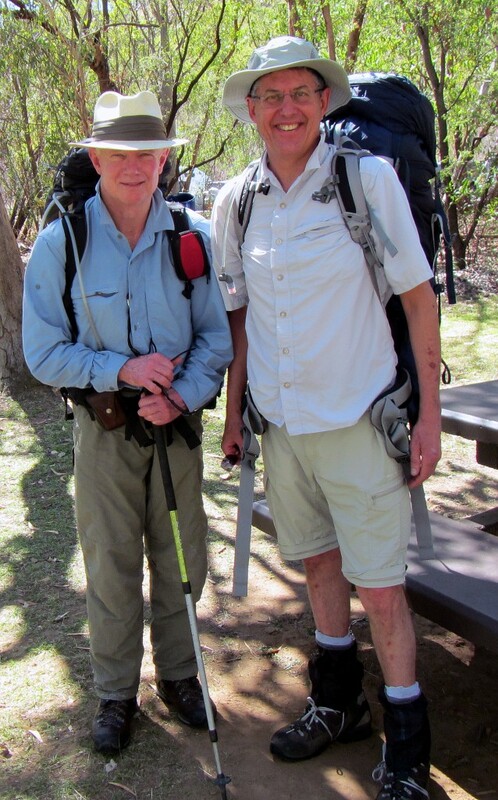 I hope Andrew Harper, my colleague, from the Tanami trip never finds out that it took me four days to walk 47 km. He’ll say that he always knew I was a big sook. Maybe he’s right. Most of the food is gone so we don’t have to carry food bags tomorrow. They were heavy to start with but have got progressively lighter each day. That probably explains why the walking has been so easy. I’m so happy to be here. I feel at peace here. Slept soundly all night again and the exercise and peace is obviously agreeing with me. Up on Wednesday, at usual time around 5.30 and crossed the river above Crystal Falls at 8 AM. Here I had cause to reflect on what an injury does to you. I used to be really good at jumping from rock to rock crossing rivers and prided myself that I could do this with a backpack on and not get my feet wet. This time I couldn’t. I had to take my backpack off, hand it across and then get some assistance, because I couldn’t jump with my bad leg. I think I’ve lost a lot of confidence. Nevermind. After being in a wheelchair for three months this year, every step is a joy. I also think that my leg it is slowing my walking pace, possibly it’s shortening my stride. I’m now only walking at about 3 km an hour where I used to be able to comfortably manage 5 to 6 km an hour. It’s not that important. I just have to make adjustments. Had an accident after crossing the river. I had to jump down off a rock ledge about a meter above the river bank. Instead of landing on my left leg, as intended, I landed on my injured right leg sending an electric shock of pain into my knee. For a terrible moment I thought I may have broken my leg again. I walked on for awhile and it appeared to be okay. About half an hour after crossing the river we visited the Crystal Falls lookout which gives a spectacular view of where we had been swimming and the falls that thunder below. This is spring water running off the escarpment down into the river system in 17 Mile Valley. Presumably, it ends up ultimately in the Daly River and then out into the ocean. The southern edge of the Arnhem land escarpment where we are walking, just bleeds water throughout the dry season. There must be a huge aquifer under our feet. We changed direction today and gradually headed north-west as the escarpment swung in that direction. After a couple of hours we stopped and visited the Amphitheatre, which is like a huge natural gully. It reminds me a little of a miniature version of the Grand Canyon. Some great rock art and also some very well-defined spear sharpening grooves in the sandstone. It was very cool down there. At 12.15 we reached our destination for the day which was the 17 Mile Fall. We camped there on the northern bank of the river. One disadvantage of walking slowly is that you are last into camp and get the worst camping spot. I had to tuck down between some rocks. Not too bad. This is a beautiful spot with the waterfall cascading down into a big round swimming hole. Very deep, clear pool but not big enough to have a swimming race. Washed my clothes again and sat on the rock ledge and let them dry. I regret bringing the second change of clothing. Completely unnecessary. I had an interesting day today. Because I hurt my leg jumping off the ledge I couldn’t walk very fast and very quickly ended up being last of the group. Soon the group in front disappeared and I was left largely on my own. I was ambling along rather than walking. I have never done this before. For the first time it occurred to me that if we got lost it wasn’t my problem anymore. I wasn’t the navigator. If the animals ran away it wasn’t my problem as there were no animals and in the evening it wasn’t my responsibility to make the fire or cook the meals. For the first time I was irrelevant to the success of the expedition. I look at the flowers, Hibbertia is out and the Honeysuckle Grevilla are everywhere. I stopped and looked at interesting termite mounds or features on the rocky cliffs. I didn’t feel pressured and I realised, that for the first time, I was just having a nice holiday. I can’t walk all that fast, but it doesn’t really matter and it puts a lot less pressure on me and I don’t get as tired. All in all, it’s much less stressful to just amble along and not try and keep up with the group. 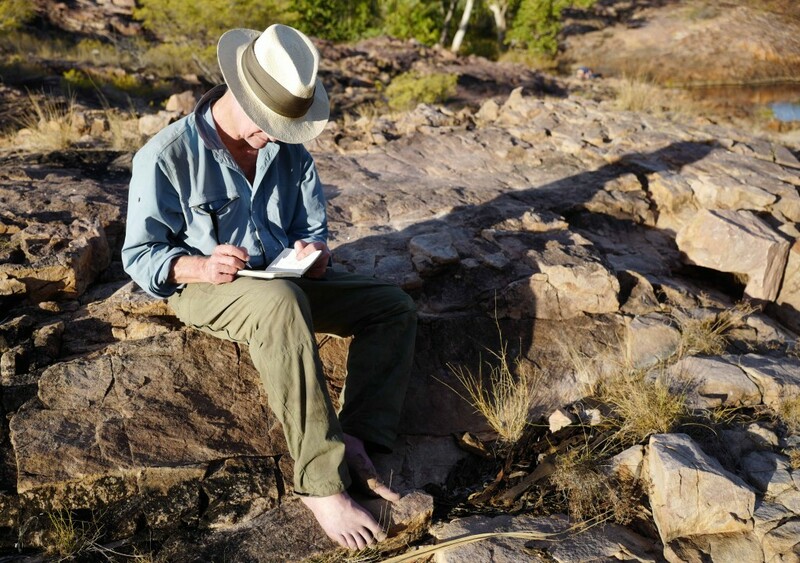 I just blissfully got lost in my thoughts and enjoyed the wonder of outback Australia. Late in the afternoon, just on dusk, I went and had another swim and sat on the rock ledge at the bottom of the falls. Everyone else was either asleep or getting ready for dinner. I had the place to myself. The sun set and threw shadows across the waterfall and surrounding escarpment. It was breathlessly quiet. The only noise was the gurgling – the eternal gurgling – of the waterfall. What a beautiful, lyrical place north Australia is, with its abundant freshwater. The only sound is mother nature working its wilful way on the sandstone as the river systems work their way to the coast. Where in the world could you do this? Drink the water you are swimming in? 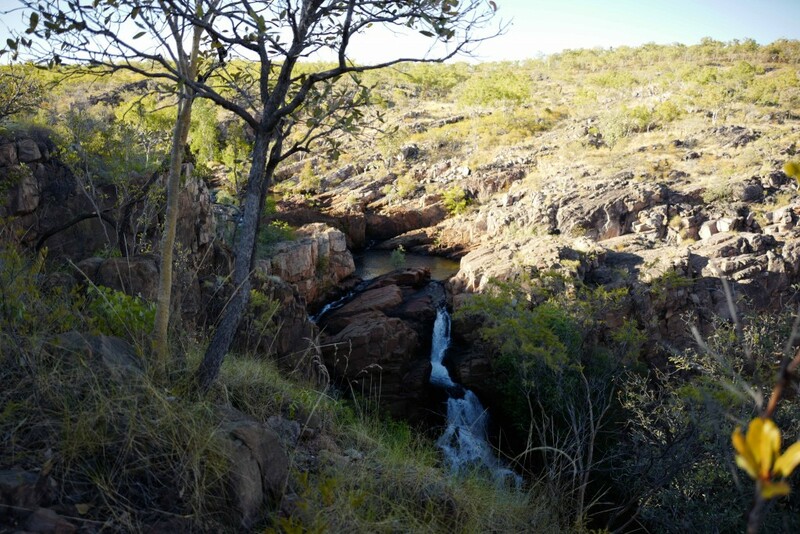 For such a dry country, we have amazing swimming holes with pristine freshwater. Maybe clean fresh water is actually one of Australia’s great legacies and assets. We probably should be protecting it more and not sticking so many big coal mines in it just so a pile of Chinese folk can get rich. That doesn’t seem like a very good trade to me. Another pretty easy day today. 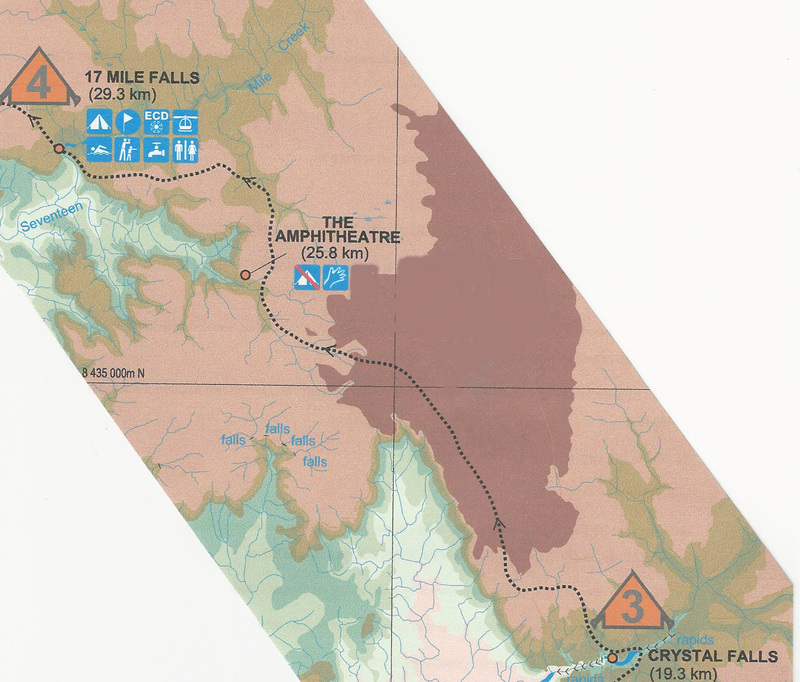 From Crystal Falls to 17 Mile Falls is only 10 km. We have now done 29.3 km in three days. We used to do that in one day in the Tanami. I’m almost embarrassed to say that I don’t care. I’m having a lovely time just strolling along looking at the scenery, having a swim in the rockholes and letting someone else worry about the logistics. The joys of irrelevancy. Covering my feet and legs with zinc cream every day. First time I’ve done this. Excellent results. Slow pace is helping. Also wearing a straw hat for the first time. Much cooler than my trusty Akubra. Tomorrow will sort us out – 17km. I think I’ll be tired after that. 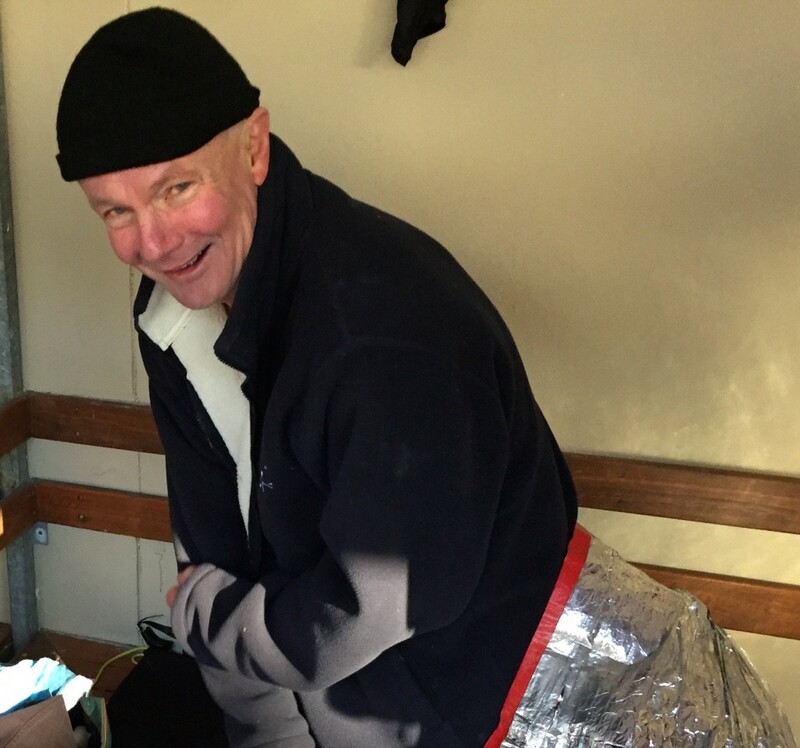 Had to roll into sleeping sheet during night as it cooled down and I climbed into sleeping bag about 4am. Moon waning but still very bright and woke me up. Up at 5.30am Tuesday and packed in dark before heading for breakfast at 6am. Barry went in for another dip. He’s keen. Good brekkie. Choice of porridge or muesli. Underway at 7.55am on a cool, bright morning. Stopped for morning tea at 9.10am at an interesting rock art site on the side of the track. Only red ochre outlines left. Must be very old. Having trouble getting my new water bladder to work and could not drink during the morning hike. Spent time fiddling with it and realised I put the hoses on back to front. New gear. Never bring it on a walk. Worked fine thereafter. Got going at 10.05am and at 11.25am stopped for lunch. They are not pushing us all that hard which is fine with me. Easy morning. 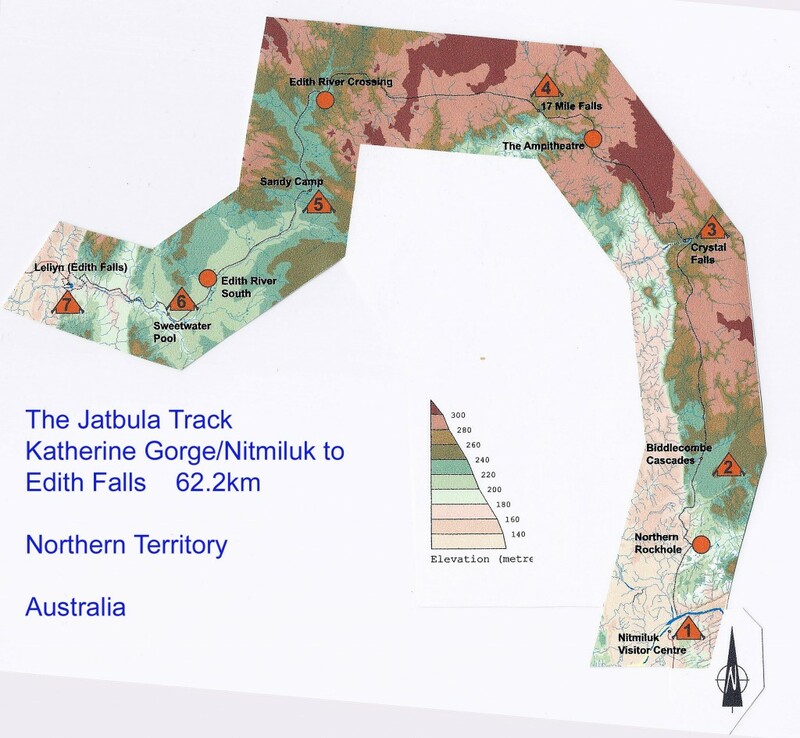 The Jatbula Track is very flat, if a bit rough and stony in places. Pandanus palm and spear grass and broken, sandstone ridges. Boulders rolled onto track. Cool SW breeze again and walking under a lot of rock overhangs made it very cool. I was in the middle of the bunch. Didn’t try to stay up front. Saw lots of termite mounds and stopped to explain to guides and group how they work. 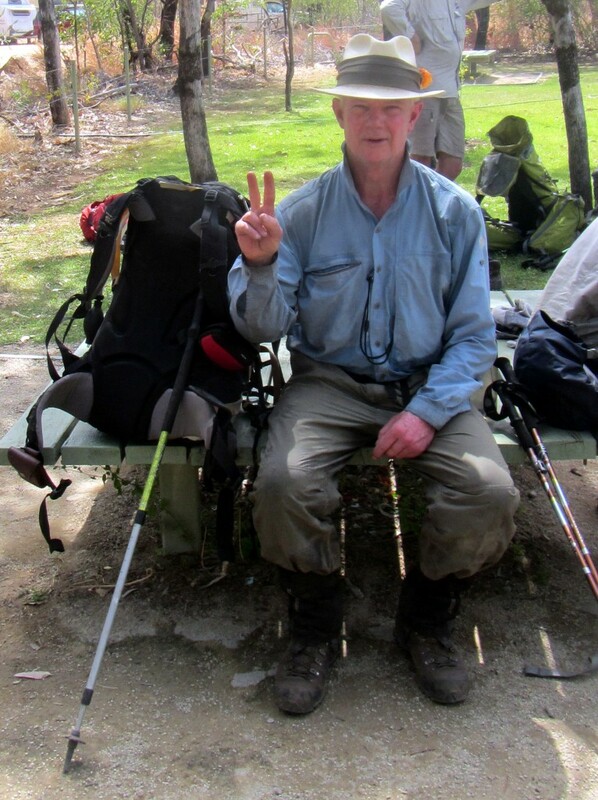 Began walking again at 12.25 almost due north al day, right on the edge of the escarpment. Sweeping views to the left over 17 Mile Valley and rough stony ridges to the right. Reached Crystal Falls at 13.30. Camped on southern bank. Another short day. Everything fine except my back is aching. Set up camp and then washed my clothes again. No need to bring spares. Wash them each afternoon and put them straight back on again. Dry in ten minutes. Challenged Barry to a race in the billabong above the falls and while I was walking down the bank slipped and my left foot landed on a tree root which drove into my left instep where I hurt it. Tape took most of the impact but blow made it really sore and I hope I haven’t aggravated it. Great race down the waterhole. I talked Barry into 20s start and it was dead heat finish. His bother Robbie said he jumped the gun and did a fast count. He doesn’t know but I’m going to double or nothing at the next waterhole. This is a really beautiful spot. Turned in at 7.30pm again. Only did 11km today which is 19.3km for the journey so far. Cruising, but I’m not complaining. I remember we did 32km one day in the Tanami Desert and I think I’m still getting over it. I’m really getting soft. Cooler night and wriggled into sleeping bag straight away. Beautiful, still evening. Moon not up when I went to sleep. Left foot is a bit sore where I trod on the tree root this afternoon. Can’t believe I did that. I don’t seem to have any luck. Hope it’s ok tomorrow. Our route on the first day. An easy 8.3km walk to Biddlecombe Cascades. And so it begins. Monday morning, 6.15am on the bus. It’s still dark and we’re gone. Met our guides, Oscar Bedford, the head guide, who hails from Tasmania and Isaac Beales, who is more junior and a trainee. Lots of dreadlocks going on. South down the Stuart Highway in the pre-dawn quiet of Darwin coming awake. Suburbs dropped away and we are in the dry Savannah. This is the great featureless road trip of Australia. Busted arse speargrass-scrub and no landmarks until south of Katherine. Tried to remember how many times I’ve done this trip. Lost count. Stopped at Adelaide River and Pine Creek. The first time I visited these two places was in 1977 hitchhiking to Darwin to get the Merparti flight to Timor and Bali on the first leg of my round world adventure. I’ve changed a lot since then but these places are pickled. Starting to heat up when we left Pine Creek at 9.30am. 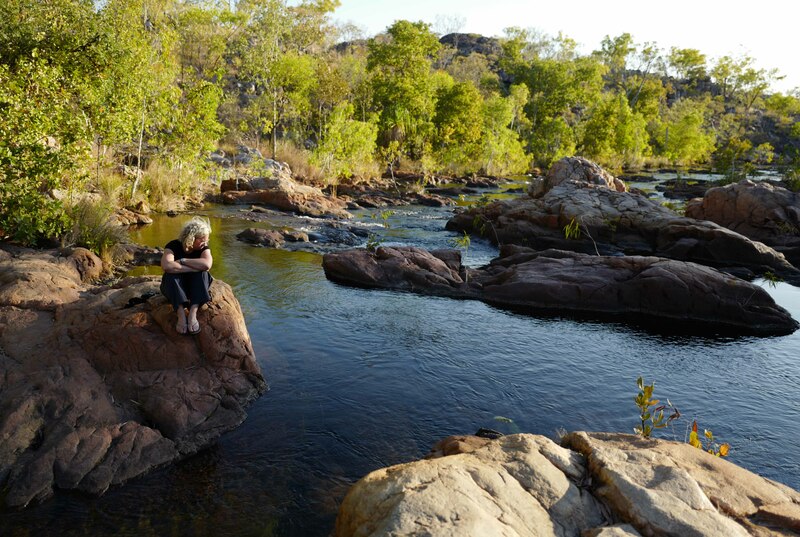 Lost in my thoughts as we headed south and soon pulled into the Katherine Gorge carpaprk at 10.55am. Right on time. Impressed with that. Distributed food bags and some fruit on the lawn. At 11.25am left the lawn with est 17kg on my back as planned. Walked down to the boat moored on the south bank of the Katherine River for the start of challenge number 2. On the far bank found I couldn’t jump from the boat to the bank with my pack on. Lacked confidence in something I would have once done so easily. Had to be helped. Formed up on a track on top of the bank that was shrouded in spear grass and got underway. Heading due north. I sat in behind Oscar, at the head of the group, who lead at a cracking pace. 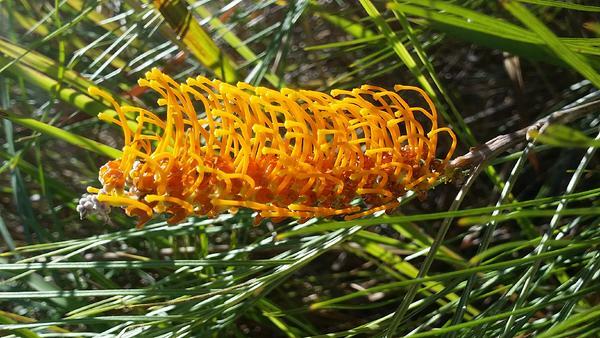 Heat boiled out of the spear grass. Track flat but dusty. Soon bathed in sweat. Everything hurt. Right knee was a bit sore but this soon passed. My right Achilles tendon started to ache after about an hour but this was probably due to the speed. At 12.30am stopped for lunch about 4km from the river at a place called Northern Rockhole. We had walked 4km in an hour. I don’t think we can keep that up carrying packs in this heat. It was an imposing spot under the escarpment but no waterfall. Beautiful SW breeze all morning, straight off Lake Eyre, hitting me in the back and cooling the sweat. Magic! 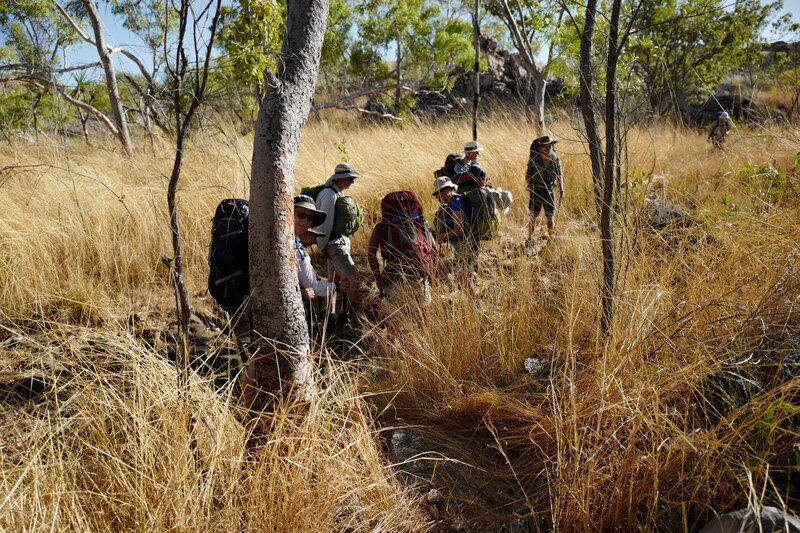 At 13.30 continued north through rough, stony spear grass country and soon climbed a gentle grade out of the valley and we were onto the southern edge of the Arnhem Land escarpment. Walked along the edge of the escarpment with views of the Seventeen Mile Valley below. At 15.10 reached Biddlecombe Falls our first campsite. Swam in a small rockhole at the head of Biddlecombe Cascades and washed my clothes. Great to have a dip. Survived first day. Tendon stopped hurting after about an hour. Right leg ok, left strapped foot is also ok. Back is stiff and sore, I think from picking up my pack incorrectly this morning at Katherine Gorge. Got to know the group around dinner. No fire. Barry Feyder and his brother Robbie; Kelvin Steggles a friend of the Feyder’s, who is a very strong walker. Tony Smuts; Amanda a pom of West Indian heritage who is all legs and also a very strong walker, and her friend Narelle Coneybeare, a petite blonde who works for Standard & Poors. I think she is a bit embarrassed about that. Joan, an Ascham-educated, famer’s wife from Tamworth and lastly a couple, Christine Sanderson and Simon Young. Seems like a good group. In bed at 7.30pm. Still muggy and hot. Just lay on top of my Thermarest under the mosquito net. There it was. As expected. Looking straight up at Antares – the red heart of the scorpion. The old clockmaker, right on cue, still spinning the constellations across the night sky of dry season Australia. How familiar. How reassuring. Lay listening to the night sounds and fell asleep. Big day arrived. Cab at 6.40am over to Barry’s place at Mosman. Picked him up and Tony Smuts, as well as Barry’s friend Kelvin Steggles. Barry’s bother Robbie met us at the airport. It was very exciting for me for the following document to come over the boarding counter. Haven’t been this excited/relieved about a boarding pass for some time. Bought a book for the plane, called the Art Forger – an American novel by B. A. Shapiro, about someone making a living forging an Edgar Degas painting. It’s really quite good after some of my recent disappointments in modern fiction literature. But it couldn’t compete with what was on offer out the window of the plane as we crossed into the desert. The Channel country loomed large with its familiar mosaic of greens and blacks, browns, reds and greys. It was ironic that I was reading a book about art, while one of the world’s great tableaus of artistic endeavor slid silently by under-wing. I was mesmerised in a way that tore me from my reading. In all my years travelling back and forth to Darwin and Katherine I never cease to be amazed by that wonderful tapestry as you cross the New South Wales/ Queensland border heading towards Mount Isa. The landscape is one of the most surreal, impressionist paintings imaginable. Nothing done by human beings comes close to that vast canvas done by nature. The familiar heat blasted me as we walked out of Darwin airport. It is 18 years since I first came up here to plan the North Australian Expedition. So many changes in my life, so much water under the bridge. Darwin has gone from a frontier town to a place where vast residential skyscrapers clutter the CBD. Nevertheless, it remains the land where the rubber thong is the favoured footwear. I’ve never seen so many people wearing thongs.We are staying in a modern block of apartments on Cavanagh Street. I’m sharing a two bedroom apartment with Tony. Dinner was a big steak at the Cav, a pub just down the street. Spent a half hour studying the maps, trying to get my mind around the challenge ahead. This will be the first expedition I have been on where I’m not the navigator. Not sure how I feel about that. Bus arrives to take us to Nitmiluk at 6.15am tomorrow. Very excited. Got weight in pack down to 12kgs, including 3 litres of water. With 5kgs of food and World Expeditions gear like a mosquito net it’s 17kg. Perfect. Let the busted leg test begin.